It’s the start of a thrilling new chapter in the Sea Ray story: The Sundancer 320 presents a bold new vision for the range and sport cruising by blending the values of a cruiser and a bowrider in one compelling package. The Sundancer 320 maximizes the use of on-board space through a reexamination of deck architecture, with three primary entertainment zones. First, the traditional bow sun-pad has evolved into a much more robust lounge seating area, inviting a group to socialize and enjoy the view. The best part? The bow can be fully enjoyed while underway. Actuated headrests, armrests and seats allow users to adjust for perfect comfort, with a stow-able table conveniently in reach. A bow sunshade extends over the area to offer protection from the sun while at rest. Meanwhile, the cockpit affords effortless, versatile enjoyment of the water, with a natural flow from the helm all the way through the transom and onto the integrated swim platform. A reversible helm companion seat converts to face aft, facilitating conversation with the rest of the cockpit. A well-equipped standard wet bar includes a sink and storage, and offers a refrigerator and grill as options. 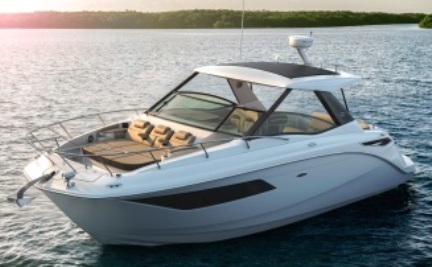 Throughout, refined finishes demonstrate Sea Ray’s dedication to craftsmanship and elegance. Aft, enjoy comfortable cockpit seating and ample storage space in the transom. Or, boaters can choose the optional sun-gate layout to gain a large sun-pad, affording great views of the water and a prime spot to relax and soak up rays. Cleverly concealed storage underneath the sun-pad holds fenders, lines or water toys. For getting out of the elements or making an overnight or weekend-long getaway, the Sundancer 320 features a beautifully designed cabin with sleeping accommodations for four. In the aft berth, two sliding twin beds can be combined to form a queen bed. In the forward V-berth, a stylish wood table converts via filler cushion to form a comfortable full-sized bed. A deluxe head, galley with extending counter tops, flat screen TV and generous storage round out this inviting space. Underway, the Sundancer 320 demonstrates its bow-rider inspirations by performing beautifully, thanks to its high-efficiency engines and a precision-engineered hull.